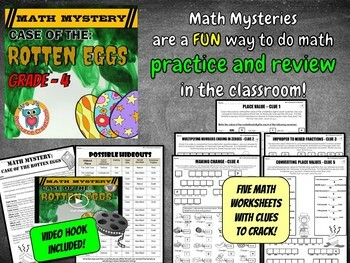 Easter Math Mystery Activity to keep your students engaged and learning around the holiday! 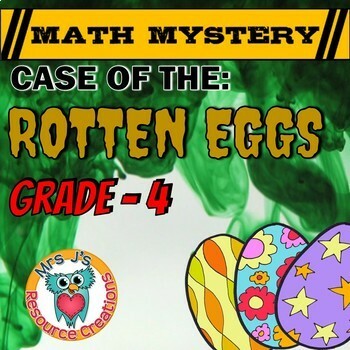 The 'Case of the Rotten Eggs' (4th Grade Edition) will add an exciting twist to your math sessions. Easy prep! Just Print & Solve! Students must use their math skills to eliminate hideouts so they can find out WHERE Slimewort is hiding! Students must use critical thinking skills to figure out what the clue is telling them to eliminate from the list of possible hideouts. The Case of the Rotten Eggs is available in the other Grade editions listed below. 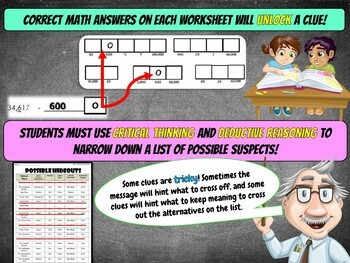 Click to check out the math skills covered in each packet. Easter Reading Mystery: Once Upon a Crime, EGGpocalypse! 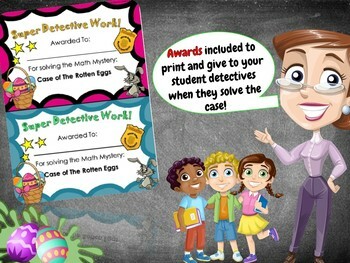 Browse the range of 4th Grade Math Mysteries HERE.